Like any dog owners, we here at Pauley’s Pups all know dogs love to lick, no matter what the situation might be. But have you ever seen your dog lick their lips? The gesture can be sort of strange, especially when there’s no food or water around, and many of you might be wondering what it is that is driving your dog to do that. Well, we’ve finally got some answers. According to behavioral experts, the main reason a dog licks their lips is because, at that specific moment, they feel threatened and want to calm down tensions. This usually occurs when an owner is notably mad at their dog, or is yelling at them for whatever the reason. 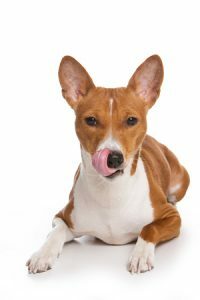 A dog perceives that the owner is acting aggressively, and will lick their lips in order to show that they are not a threat. In the end, it’s a peace offering. In order to prevent this from happening, take the offering, and de-escalate the situation before the dog gets aggressive him or herself. (You may even avoid getting bitten.) Learn to talk to your dog in a healthy, fruitful way, rather than resorting to aggressive tones. You never want your dog to feel stressed and uncomfortable in any situation. Another reason for lip licking is illness. Like humans, dogs create saliva when they’re feeling nausea, or have a dental disease. This causes them to lick their lips constantly. Dog owners should always keep a close eye on their dog, so they can spot the signs of illness before they get any worse. Lip-licking being one of them! If you have any other questions or concerns about your pooch, we here at Pauley’s Pups are happy to help. We know that owning a dog can be a lot of responsibility, and owners often just want answers to the questions they’re facing. That’s where we come in. Contact us today by calling 804-798-7877.